Singles from Come Get It! Come Get It! 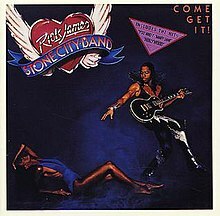 is Rick James and the Stone City Band's debut album on Motown sub-label Gordy Records. It was released in April 1978. The singles, "You and I" and "Mary Jane" pushed Come Get It! to gold status. ^ Hanson, Amy. "Come Get It! - Rick James : Songs, Reviews, Credits, Awards". AllMusic. Retrieved 2012-06-20. ^ "Rick James US albums chart history". allmusic.com. Retrieved 2011-06-15. ^ "Rick James US singles chart history". allmusic.com. Retrieved 2011-06-15. This page was last edited on 4 November 2018, at 03:41 (UTC).